There are many reasons why you may want to play free slots without need to download. It may be the case that you want to try a slot out for the first time to get a feel for it before you make a deposit. It might be that you just love a particular slot game and you enjoy playing it for free or for real money. There may also be other associated benefits, such as to unlock other slots (typical when playing social slots on sites like Facebook). Whatever your reason there are many ways to play free slots with no need to download software. One of the most obvious ways of finding free slots, no download, is visiting an online or mobile casino. 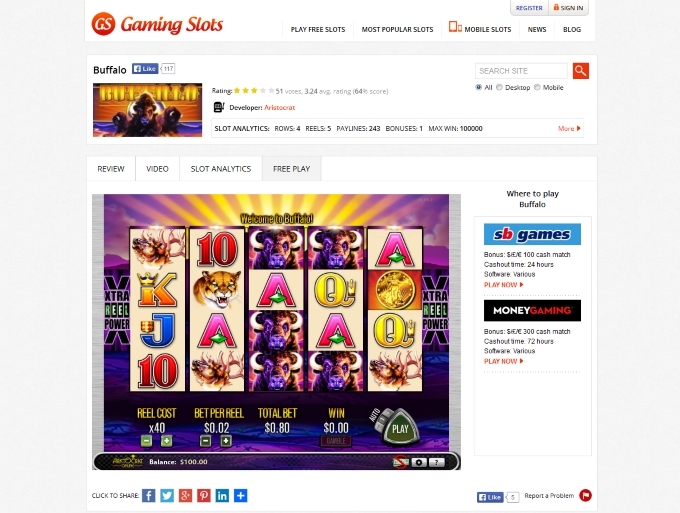 Usually under the ‘games’ or ‘slots’ tab you will find a selection of video slots available to play at their site. In some cases a casino will allow you to play slots for fun with no download required. However, many online and mobile casinos do require registration before playing any of their slots. This can annoy some visitors, who want to play no download free slots without the need to register. Not all require registrations though so you will be able to play slots for free without the need to download the casino software. Look for casinos that offer ‘Instant Play’. 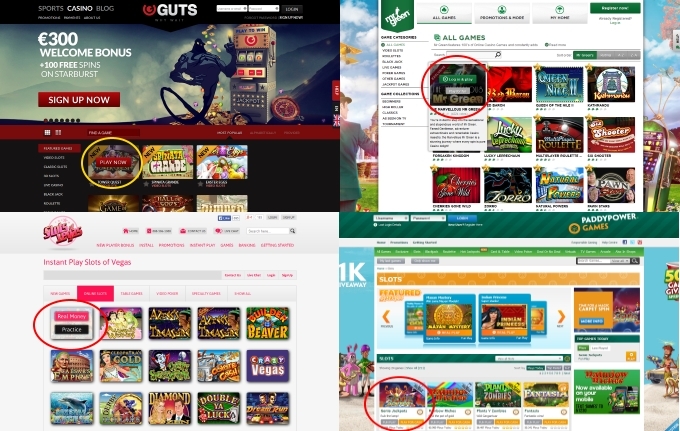 From the image: Guts.com, Mr Green, Slots of Vegas and Paddy Power Games all have free slots no download. A typical way most people would go about looking for free play slots no download required would be through a search engine like Google, Bing or Yahoo. In the main search engines do what they can to deliver the most relevant results based on your search. I put this to the test, by conducting a search of my own in the three major search engines to see if they could actually deliver me free slots with no download needed. I punched in my search ‘free slots no download’ and here is what was thrown back. 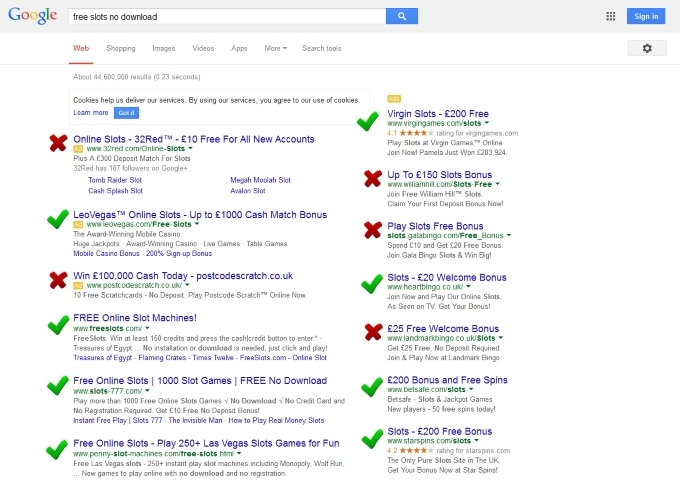 On the whole search engines are a pretty successful way of finding free slot games without download. However, which slot games you get with each of the search listing may vary significantly. This could be a problem if you are looking for slots from a particular slots developer or you have a specific game in mind. Possibly the simplest way of playing free slots with no need to download is through a slots portal. There are a few around and they are usually well organized with slots in different categories. Gamingslots for example allows you to search by individual slots developer. So if you are looking for slots by Aristocrat, you can go to the Aristocrat page and find all the slots in one place. You can also use the search bar to type in the slot you are looking for and the auto complete search should help you locate the slot game you are looking for. At present Gamingslots does not have every single slot game available online, however it does have over 1000 slots, with many of the most popular available. If any slot game is not working you can always use the ‘report not working’ button and it will usually be fixed in a few days. *search conducted on April 8, 2015 on UK versions of the major search engines. Online gambling in the UK is perfectly legal and therefore no restrictions on what listings would appear from a search of this nature.